This beautiful window mannequin is a man headless bust without arms that reveals the upper thighs. It is possible to paint it in different finish: matte, glossy (gloss lacquered), satin and color you want. This mannequin is ageless and is designed for maximum durability: it requires little maintenance. This bust man adapts very well to different displays and collections of the moment. Easy to use, simply place it on a flat surface. 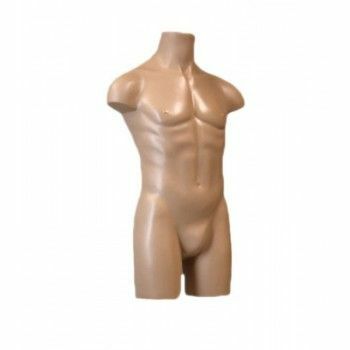 To customize your merchandising, Mannequins Online offers you busts so you can change your windows regularly. Mannequin Bust Man headless, armless with upper thighs. Polypropylen bust. Possibility of paint in different finish: matte, glossy (gloss lacquered), satin and color you want. Easy to maintain and use, just place it on a flat surface. Men bust delivered without base or clamp.